Remember folks, self care is important. So once you’ve finished making these, be sure to brew yourself a big cup of tea, put on your favourite PJ’s and kick back with a good movie. I guarantee this will significantly enhance the flavour of these cupcakes. The cake recipe I used is my favourite chocolate cake recipe from Add a Pinch. If you have another cake recipe that you prefer, by all means use that one instead. Just note that I will seriously question you if you declare that you’ve found a chocolate cake recipe that is superior to this one. Part of the reason that I love this cake recipe so much is that it is a complete one bowl wonder. Start by combining all your dry ingredients together in a bowl. I usually mix this up in a stand mixer, but you could just as easily do it by hand. Next, add your milk, vegetable oil, egg and vanilla and beat it up until it’s while combined. The batter will be a little on the thick side. Finally, you’re going to add some boiling water to the batter and mix again until well combined. It should be super runny. 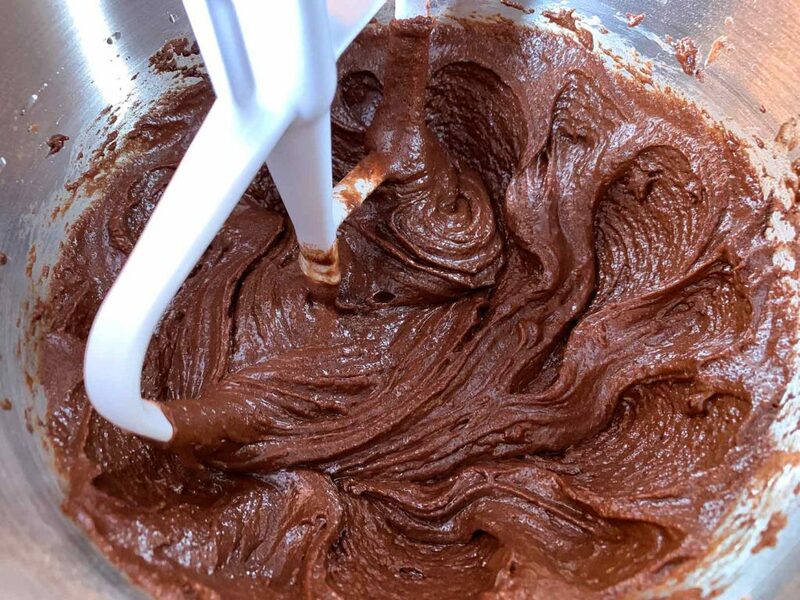 Give the sides and bottom of the bowl a good scrape to make sure there are no bits of thick batter clinging around. Line a muffin tin with cupcake liners and then distribute the batter evenly across them. This recipe makes enough for 12 regular sized cupcakes. You’ll notice the cups should be just over half, or nearly 3/4 full with batter. 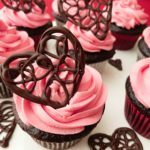 Now let’s talk about the raspberry buttercream! This is the first time I have ever made a fruit flavoured buttercream and I was quite pleased with how it turned out. It does take a little longer to prepare, but I think it’s worth the effort. 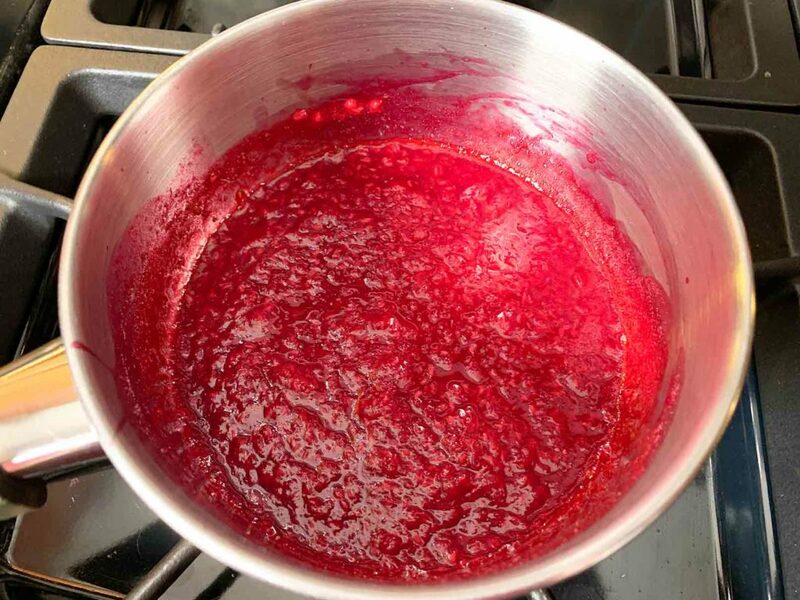 To start off, you need to make a sort of raspberry puree (you can use fresh or frozen). 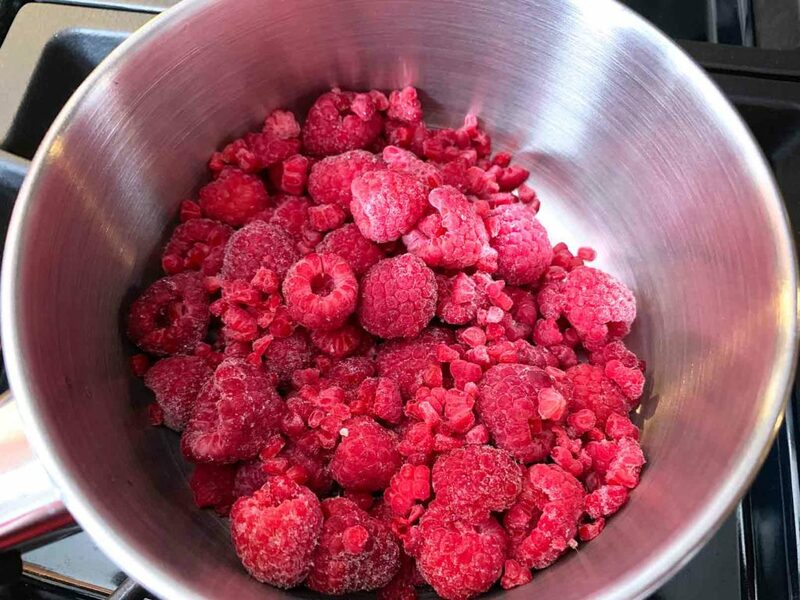 Place the raspberries into a small saucepan over medium heat. As they’re getting warm, mash them up, and then let them simmer on the stove for 5-10 minutes. What you want to do is evaporate some of the water off so your buttercream doesn’t end up all runny. Now take your simmered down raspberries and run them through a fine sieve to strain out all the seeds. You should end up with a nice little heap of raspberry goo. Set this in the fridge to cool completely before you start on your buttercream. The rest of the buttercream is pretty straightforward. Beat the living daylights out of your butter and sugar until nice and fluffy, then beat in the raspberry puree. Again, be sure the raspberries have cooled before you add them, or else you risk melting the butter and you’ll have a soggy buttercream. 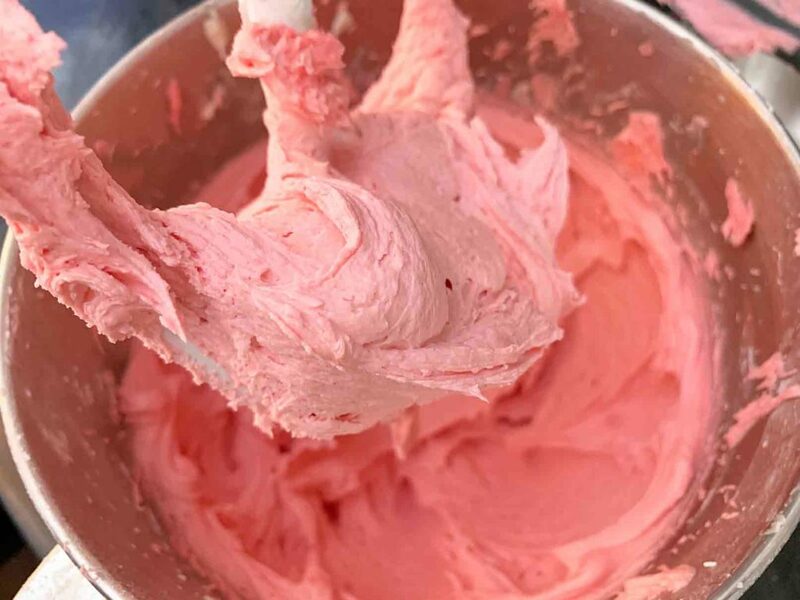 The raspberries will turn the buttercream an absolutely beautiful shade of pink (there isn’t a single drop of food colouring in this frosting!). You can use the buttercream to decorate your cupcakes any way you’d like, but for reference, I used a Wilton 2D decorating tip to pipe what you see in the picture below. 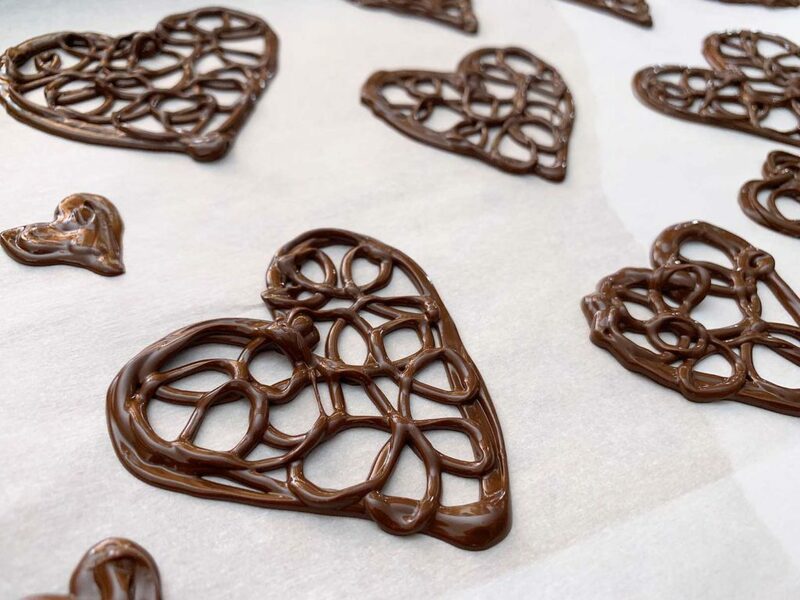 If you want to add an extra little decoration, you can melt down about 1/4 cup of semi-sweet chocolate, and use it to pipe some little heart shapes. For these I started out by drawing the outline of a heart and then filled it in with a bunch of squiggles. You can make a template for yourself, or just freehand it. Love isn’t perfect, so these don’t have to be either! 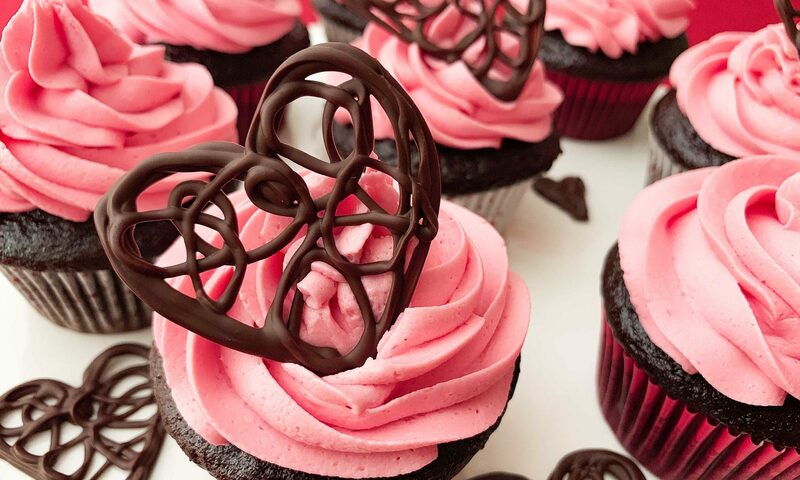 Set the chocolate hearts into your frosting and take a step back to admire them. Now remember what I said at the start of this post? Go put on a pot of tea and get into your pj’s. If you’re going to do this, do it right. Once you’re curled up cozy on the couch, you can take your first glorious bite! Ah, bliss…I mean, you could also give one to a loved one or something if that’s more your style. But seriously…People…Self care! Pre-heat your oven to 325°F. 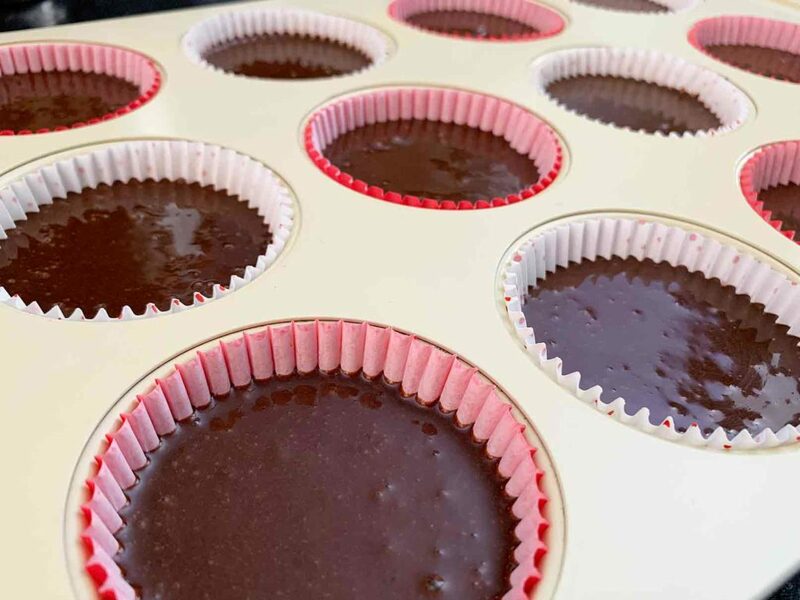 Place cupcake liners into a muffin tin. This recipe makes enough for 12 regular sized cupcakes. 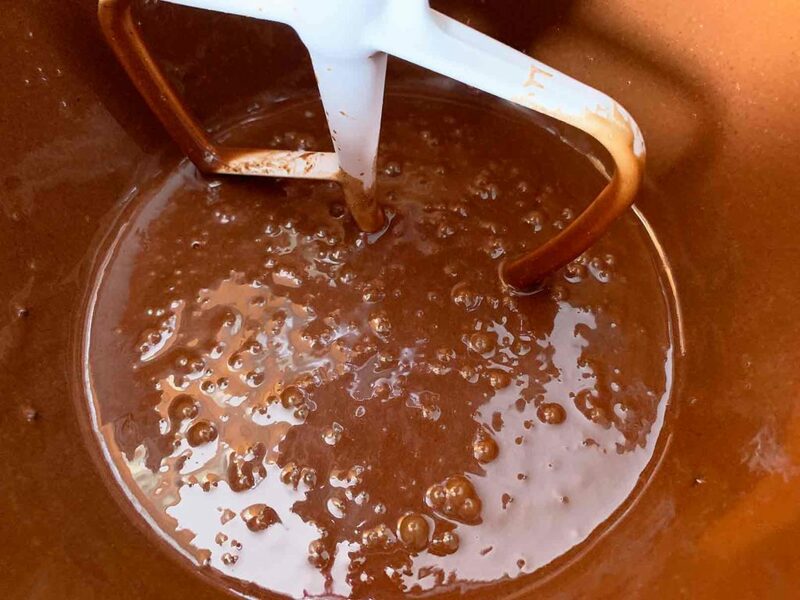 In a large bowl, sift together flour, sugar, cocoa powder, baking powder, baking soda, salt and espresso powder. Mix well to combine. 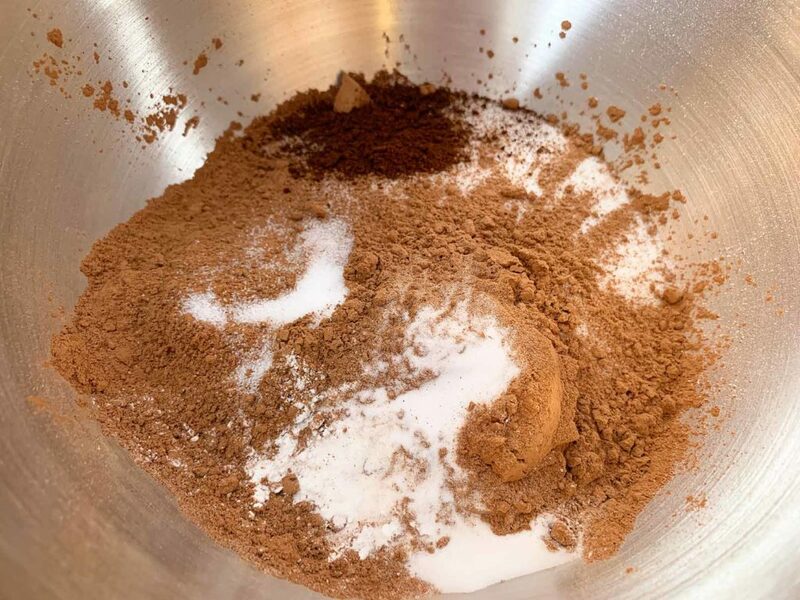 Add the milk, vegetable oil, egg and vanilla to your dry ingredients and mix together on medium speed until combined. Adjust speed to low, and slowly add the boiling water. Beat on high speed for about 1 minute. Scrape down the sides and bottom of the bowl half way through. Distribute the cake batter evenly across 12 muffin tin cups. They should be about 1/2-3/4 full when you're done. 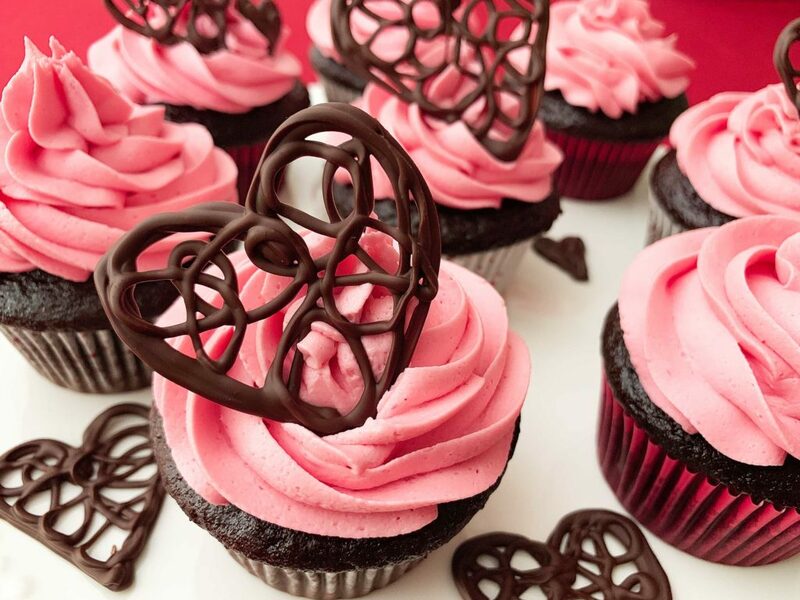 Bake for about 20 minutes, or until a toothpick comes out clean when poked into the centre of a cupcake. 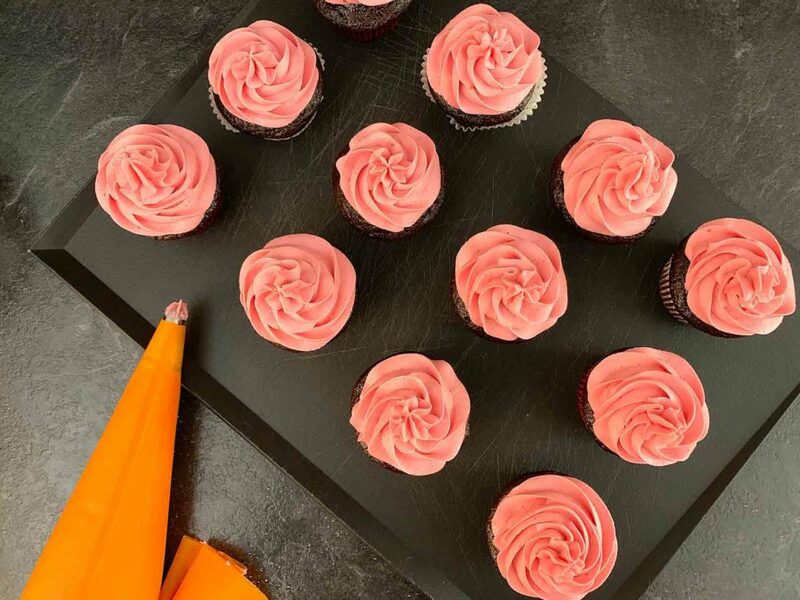 Allow to cool completely before frosting or decorating. Heat the raspberries in a small saucepan over medium heat. Break them up with a spoon or fork as they warm. Let simmer on medium heat for 5-10 minutes until slightly thickened. Your goal is to try and evaporate some of the water content out of the raspberries. 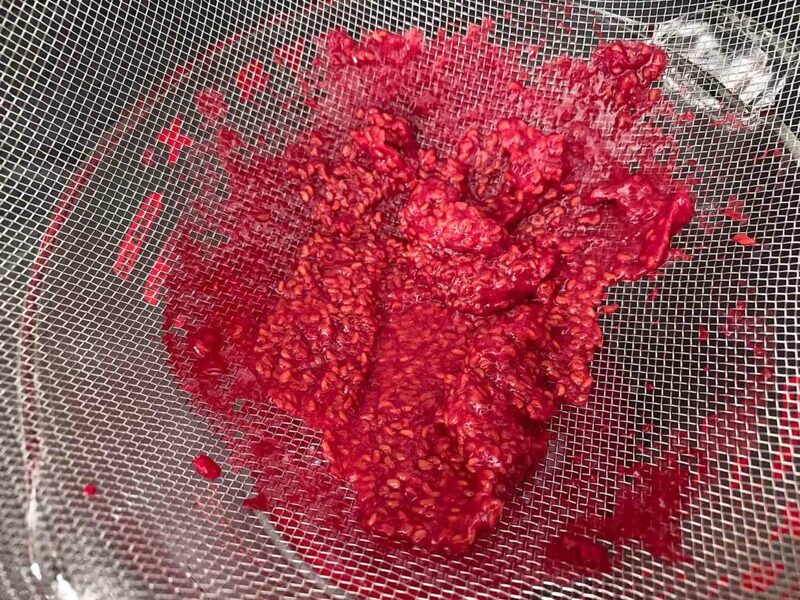 Strain the raspberry sauce through a fine sieve to remove all of the seeds. You should end up with about 1/3 cup of puree. 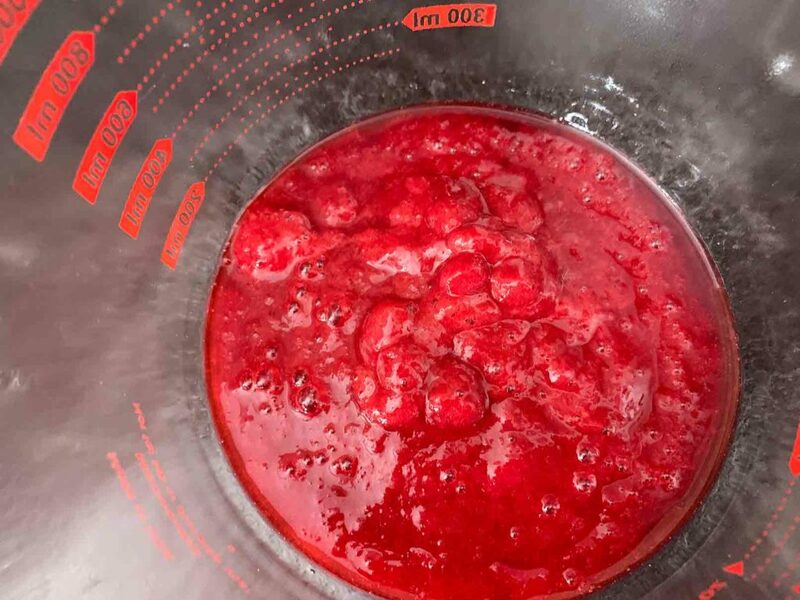 Place the raspberry puree in the fridge to cool down completely. In the bowl of a stand mixer, beat the butter until nice and fluffy. Add half of the the icing sugar, 1/4 cup at a time, beating well between each addition. Add the raspberry puree (about 1/3 cup), and beat well until combined. Continue adding the remaining half of the icing sugar, 1/4 cup at a time, until your desired consistency is reached. 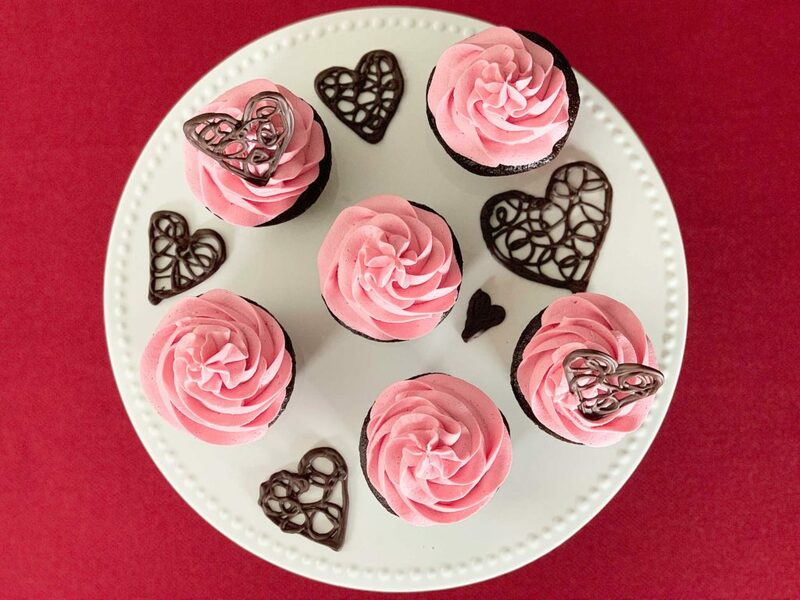 Transfer buttercream to a piping bag and decorate your cupcakes! 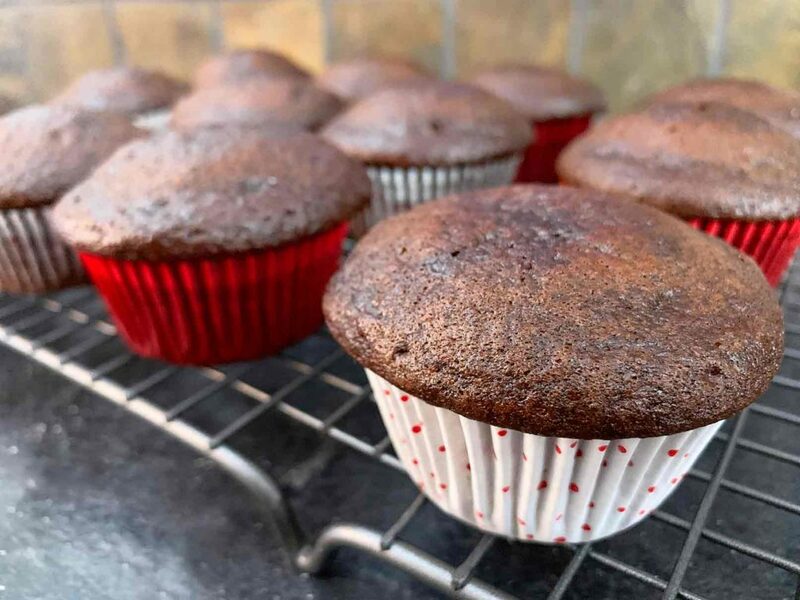 You can add a little more or less raspberry puree, depending on the colour and flavour you want, but you may also need to adjust the amount of sugar a bit to get the right piping consistency.